ur services are divided into three separate yet related areas: organization, compliance and marketing. A campaign is nothing if it is not organized, failure to comply with campaign laws and conventions will quickly derail a campaign, and the primary goal of any campaign is to promote a candidate's "brand" and influence a majority of people to remember and vote for it. Ultimately people simply vote for what they recognize and in their mind has the best image. Use the links on the left to jump to specific examples of these services! A campaign plan consists of milestones marking the goals that need to be achieved for a successful outcome. There are always two principle goals: one is to raise money and the other is to use that money to build the candidate's brand. These goals feed on each other: the more visible the brand the more money that can be raised which is used to increase the visibility of the brand! The truth is that when the voters get to the poles they vote for a name that they recognize, exactly as product advertising convinces you which soap to try in the supermarket. The more visible your brand and the closer that voters identify with it the more likely it is that you will win. Different aspects of the brand building enterprise are launched throughout the campaign. Websites and social media appear early, yard signs and rallies appear somewhere in the middle, and radio, television, billboards and so forth blitz near the end. Fundraising milestones must be established to fill these budget goals throughout the campaign. Squeaky-clean financial management avoids embarrassing attention and builds a trustworthy brand. Since financial reporting is transparent it is critical that disallowed contributions be filtered even before they reach the campaign accounts. Short deadlines exist for resolving problems or reimbursing expenses, and reporting deadlines must be met. Qualified professionals who know the rules and reporting procedures are essential to your campaign. A fundraising event for a Federal campaign is the responsibility of the host and the total cost of the event including rentals, catering, supplies, and so on count as a campaign contribution from the host. This combines with any other previous contribution and counts against the host's per-campaign limits. An itemized list of the event costs must be provided to the campaign treasurer. Who may pay for a fundraising event in a local campaign is governed by state and local statutes. In a Federal campaign at some events the campaign may collect contributions, and at some events only the host may collect them. Local campaigns are subject to the restrictions of state and local statutes. Of course the campaign or the host may utilize a service to give your brand a boost at fundraising events. Avoid potentially embarrassing problems by immediately checking past contributions. Credit card donations can be processed onsite with full contributer information added or verified in a campaign database. Make sure to ask for a demonstration to make sure contributions are handled smoothly at your events! Coca-Cola and Walmart both succeed because they have convinced people they provide quality. The website for a political campaign is an avenue to promote the candidate as a quality brand, accept contributions over a vast geographic area and coordinate the activites of volunteers and events. It must be presented in a professional, simple manner that proclaims the candidate and campaign is a quality operation. Our affiliate New Media FX holds the keys to providing a clear and concise message, professionally and legally processing contributions while avoiding embarrasing problems, and incorporating the tools to manage events and volunteer staff online. Social networking builds the candidate's brand in several ways: it provides a flexible platform for broadcasting information immediately to an audience, it advertises that the candidate stays on top of the game, it helps drive people to campaign events, and most importantly it gives people a personal connection and makes them feel that they are part of the campaign. Facebook, MySpace and similar services put a face on the candidate and the campaign, they allow visitors to keep in touch with what is going on and feel that they are a part of it. The number of visitors itself helps; the more pople who are connected to the campaign helps drive the brand visibility. The Twitter service provides a unqiue channel where information is pushed immediately to campaign "followers." This allows immediate dissemenation of information to a large audience, a great way to refute misinformation or lure people to current venues. Use Twitter to provide the sense of a personal message direct from you to each of your followers. To build your candidate brand your online presence, printed advertisements and broadcast media all need to present a consistent message. It is important to have a similar visual and audio tone and build the brand with its message through every avenue. Coordinate all your promotions through a provider who understands each of the venues and ensures compliance with all of the legal restrictions you are under. Spam is unsolicited email, the junk-mail of the Internet. The CAN-SPAM act provides penalties for sending unsolicited commercial email. While a political campaign is not legally bound in the U.S. by the CAN-SPAM act, realistically there are limits on what, where, and how much email can be sent. Corporations and public email services block email that looks like junk, subscribe to blacklists and block listed spam sources. Internet service providers limit the quantity of email their customers can send to avoid being blacklisted. A bulk email service such as Constant Contact must be used to send campaign messages, but to avoid being blacklisted they too will monitor who you send messages to. The solution to getting the message through is to use a vetted list of known good addresses where the subscribers are open to receiving a communication. You should only use a lists built from people who register with the campaign, or who registered in the past with a related campaign. Volunteer management is a little different from other organizations or groups because a large number of volunteers and their skills need to be matched with a variety of campaign event types. Website applications can be used to register volunteers and record their skill sets and availability. Database driven campaign tools can help match skills and availablility against campaign events. They can also ensure an even distribution in the selction of volunteers to make sure that everybody gets a fair shot at helping the campaign. Copyright © Smallrock Internet Services, Inc. All rights reserved. 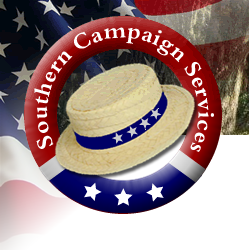 • Southern Campaign Services and New Media FX are divisions of Smallrock Internet Services, Inc.